Working and Thriving in Washington, D.C. Seated around a table in Union Station recently, four Hope students on the Washington, D.C. Honors Semester talked with “Stories of Hope” about their experiences living, working and thriving in the nation’s capital. Junior Luke Stehney (a political science major from Royal Oak, Michigan) is a constituent affairs intern for Rep. Paul Mitchell’s (R-MI) office; Senior Angelique Hines (an English and political science double major from Chicago, Illinois) is an educational policy intern in Sen. Richard Durbin’s (D-IL) office; Junior Joe McCluskey (a political science major from Burton, Michigan) is on the development team at the Bipartisan Policy Center; and, Junior Tom Kouwe (an economics and math double major from Wheaton, Illinois) works in the dairy division of the U.S. Department of Agriculture. 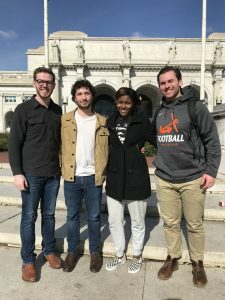 Left to right, Joe McClusky, Tom Kouwe, Angelique Hines, and Luke Stehney, in front of Union Station in Washington, D.C. Stories of Hope (SOH): What is the one thing you want people back home to know about what it’s like to work in D.C. during a tumultuous political time in the country? Luke: From the bleachers looking in on D.C., you think it’s all divided, that everybody’s always in turmoil or conflict. But when you’re here, it’s not like that. If you want to argue with someone, you can find it. But for the most part, people are trying to straighten everything out and work together. And that’s not often portrayed in the media. No one wants to read about people getting along. But really, people out here are trying to do good things. They’re good people, and they’re trying to make things work. Angelique: I feel like everything looks bad when you’re watching it on the news, but when you’re here and you’re living it and you’re attending the hearings and briefings and you’re hearing the conversations that senators are having with each other — and it’s not always arguing about DACA, you realize that they’re actually just trying to do what they think is best. Everyone thinks that they’re doing what’s best. It’s just ‘best’ in their definition. But they’re sincere about it and hardworking, too. SOH: What is one surprising thing you’ve encountered in your work as interns? Tom: If you want to work in Washington, D.C. at a place other than the Capitol, you’ll find it because there are people here with all different kinds of areas of expertise. I mean, I think I knew that before, but I didn’t really think about it until I got here and saw people working for the government who don’t have the same talents as someone giving a speech in Congress. One of my supervisors helped to negotiate NAFTA so she was trained as a diplomat. And that’s kind of comforting because when I think about all the different functions the government performs, I don’t want it to be run completely by people who all have the same set of skills. I like that the government really draws on people with all kinds of talents. SOH: Give us an overall review of the D.C. Honors Program. If someone is thinking of enrolling in the D.C. Honors semester , what advice do you give him or her? Joe: Just do it! If you just see D.C. from the news, you could think, ‘Why would I do that? Why would I want to be there?’ But then you come here and you see purpose. And that purpose is public service. Angelique: Even if you’re afraid, just try it. It may turn out to be the best experience of your life. Because if you don’t try, then you’ll always live with the regret of wondering, ‘I could have or I should have.’ Or you’ll see people on Snapchat having a good time and you’ll feel like you’re missing out. Tom: It’s a good opportunity even if you’re not in the political sciences. As I said before, a lot of different skill sets can fit into D.C. You don’t have to be working in a representative’s office, or in a think tank, or whatever you would stereotypically think a D.C. job is. There’s a lot to do here regardless of where you’re coming from academically. Luke: Studying abroad is a great thing, but a great part about D.C. is that it is a true international city. There are so many world cultures represented here. You hear several different languages on the Metro everyday. Plus, they say New York never sleeps but D.C. truly never sleeps, too. There’s a lot you can learn by living in the nation’s capital. SOH: Last question. You are going to be inheriting the good and the bad of American politics in your futures. As you consider your career ahead, whether it’s here in D.C. or in some other part of the country, how are you going to roll up your sleeves and make a difference in American public life? Tom: For most of my life, and even a little bit now, I have had a distasteful view of politics and I try not to be hyper-political all the time. That’s part of the reason I’m not a poli-sci major; it just has never really interested me. But I think what the D.C. program has taught me is having political views and having political opinions doesn’t have to be driven by a desire to have a political job. So I might not have a job when I graduate that is super political in nature but that doesn’t mean that I shouldn’t be politically active in my own community or even just having discussions like these with other people. I think it’s showing me that to have an impact, you don’t have to be an elected official or an appointed official. Luke: A big realization I’ve had is the concept of cooperation in government and politics. People want to make a difference but they can’t do it on their own. You can’t do it within your party. You can’t do it within your branch. You have to work across the aisle, across all of D.C. So in terms of cooperation, it takes all hands on deck and everybody going in the same direction, and that’s hard to achieve honestly. Not everybody wants to go in the same direction all the time. I’ve honestly learned here that politics isn’t negative; it’s not gloomy. It’s very positive. People want to help other people, and it gives you hope for the future because they want to sincerely make a difference. I hope to do that, too. Joe: This past summer I read a lot about Robert F. Kennedy. Just reading about him and reading the speeches that he gave got me thinking, ‘Someone could give that speech today and you would never know it was written 50 years ago.’ So I think being mindful of history is essential for the present and future because it reminds me that there’s always work that needs to be done. And, like Luke said, there’s not one person that’s going to be able to do it alone. We may not even see the change we want in our lifetime but that doesn’t mean that we shouldn’t work towards it because the next generation needs us. We tend to think of politics as operating in the here and now. So keeping politics in context is something I intend to do. It’s not easy but it’s necessary. Angelique: I just think that public service is important. Go out and serve your country. That doesn’t mean you have to go and join the Army. Organizations like Teach for America, which I hope to do, or AmeriCorps, serve our country as much as politicians do. And public service is really important especially when it comes to children. Whether it’s big or small, help your country in some way. Posted on March 12, 2018 May 14, 2018 Author Eva Dean FolkertCategories Social SciencesTags Washington DC Honors SemesterLeave a comment on Working and Thriving in Washington, D.C. It is time, long overdue, for Americans on both sides to give and show grace. It’s time — after a combative election, after a presidential inauguration, after a momentous march — to be about the work of listening and respecting. Piper and Rogers know they are both small and opposing cogs in the vast political machine that propels two sides of this democracy, but they’ll do their part to respectfully listen and understand. It won’t be easy; Piper and Rogers know this. After all, there is over a year and a half — maybe more — of turbulence to navigate. Rogers admits that Trump’s rhetoric played a part in national fear and unease but he’s hoping for a new start. Piper recognizes that the Women’s March, while giving her a strong sense of community and freedom, lacked a certain cohesiveness due to its numerous platforms. And though they are both small and opposing cogs in the vast political machine that propels two sides of our democracy, they’ll do their part to respectfully listen and understand in a city rife with angst and tension. Both students applied to Hope’s off-campus D.C. experience back in the fall of 2015, never foreseeing the national divide and political climate they’d be wading into. Today, the two want nothing more than for our nation to heal. 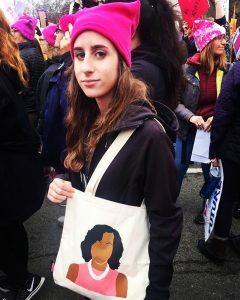 Senior Alex Piper, a history and political science major, participated in this past weekend’s Women’s March. 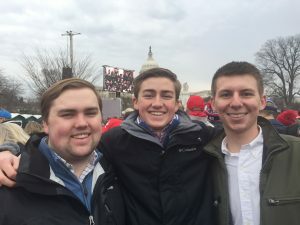 Junior James Rogers, far right, with Hope friends, Murray and Dawson Sales at the inauguration of President Trump. And it means for someone else to be willing to do the same. Rogers sees that happening with his fellow D.C. students on a regular basis, but he also found such an encounter in an Uber ride the day after the inauguration. Traveling back into the city to return the rented tuxedo that he wore for the black-tie, bipartisan Michigan Inaugural Gala, Rogers struck up a cordial conversation with his self-identified liberal/progressive driver. They each calmly spoke of their political differences as well as their shared sadness over the current derision in America. 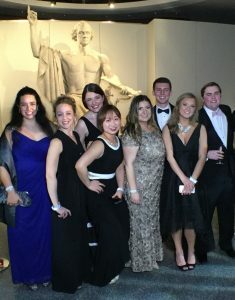 Part of the Hope contingent at the bi-partisan Michigan Inaugural Gala held at the National Museum of American History. Dr. Virginia Beard is second from the left. Twenty other Hope students on the Washington Honors semester feel much the same way as Rogers and Piper, reports Dr. Virginia Beard, associate professor of political science and this year’s director of the program, even though the student group is virtually split 50-50 along Republican and Democratic lines. With Beard’s guidance, all are unpacking what they’ve seen and felt since the start of the semester. With tensions high and political banter non-stop, all are working as best they can to be objective and not overly ideological, she says. But it’s not been without some tough talks. All are working as best they can to be objective and not overly ideological. But it’s not been without some tough talks. Inaugurations become history and marches end, but as Beard and her students in D.C. see it, the love and grace of Jesus must abide. Curious to learn more about the Washington Honors Semester? Follow our students’ D.C. adventures on Instagram.